Instagram is the place to find beautiful landscapes and jaw-dropping travel photography from Bali. But where are the greatest locations? Whether you’re a casual user of Insta or one who gets paid to go on holiday and receive endless freebies, we list the top ten snap-happy locations. The photogenic paradise of Bali isn’t just beautiful when you see it in person, it is also aesthetically pleasing in pictures too! From endless seascapes and landscapes to colourful cafes and unique boutiques, Bali will make you want to whip out your phone every time you turn a corner. 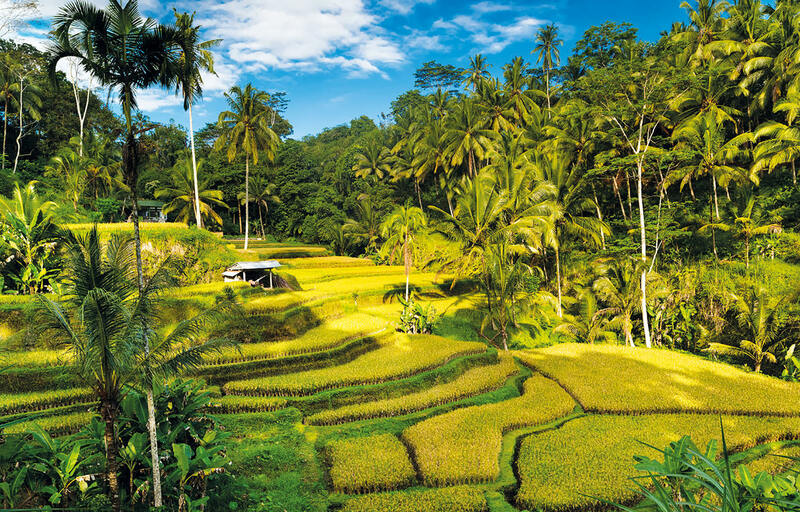 Immerse yourself in the local Balinese culture and explore these Instagram-friendly sights. This family-friendly location is very unique and Instagrammable. Enjoy lunch under its famous huge “parachute” roof, within a cozy atmosphere. The chef is quite famous for creating experimental Indonesian dishes, such as wood-fired meals, made from fresh vegetables straight from the garden. So take a selfie set beneath a huge vintage parachute, amidst rice paddies that give off a distinctly carefree, laid-back vibe. Pura Lempuyang Temple, also referred to as the Bali Gateway To Heaven, is one of the oldest and most sacred temples on the island. Famous as a “temple shot above the clouds”. Lempuyang is such a photogenic temple and it is easy to reach. If you want an amazing picture with a reflection of the lakes, then you can pay a small fee. It’s worth the fee to see the mountain in the background. There may be a two-hour queue to have a photo taken. Chill by the pool in this friendly and relaxed atmosphere. Have an instantly Instagrammable cocktail or a delicious taco amongst Panama Kitchen’s little lights, colourful tables and beach chairs. The food is delicious too. Juicy tuna steak, served with garlic butter fries, sautéed veggies and a generous amount of molten lemon butter. A cozy, family-friendly restaurant. 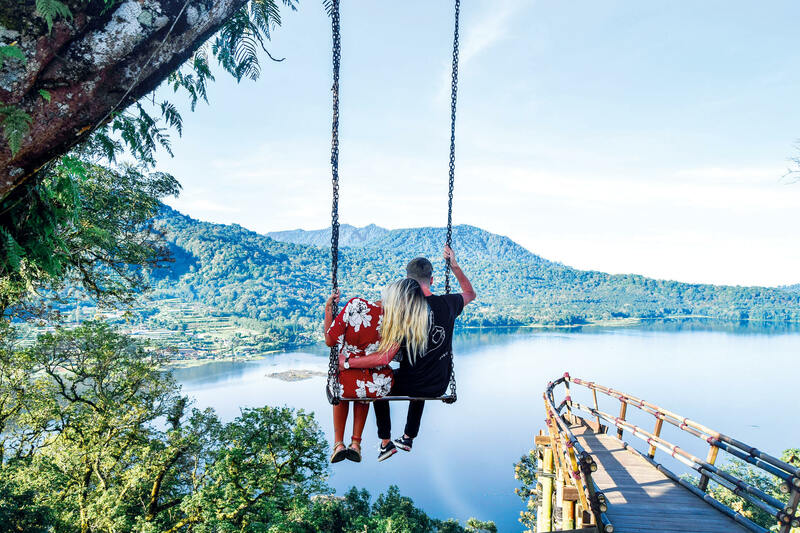 The hugely famous Wanagiri Hidden Hills and Bali Swing pops up on everyone’s Instagram feed these days and is just a short drive up from Bedugul. You can travel from Canggu on scooters in roughly two hours. And it’s only a short ride from Handara Golf & Resort (The Bali Gates). Look out for several bamboo platforms and specially arranged photogenic swings as you arrive. The Bali swing is a great example of how powerful social media has become. 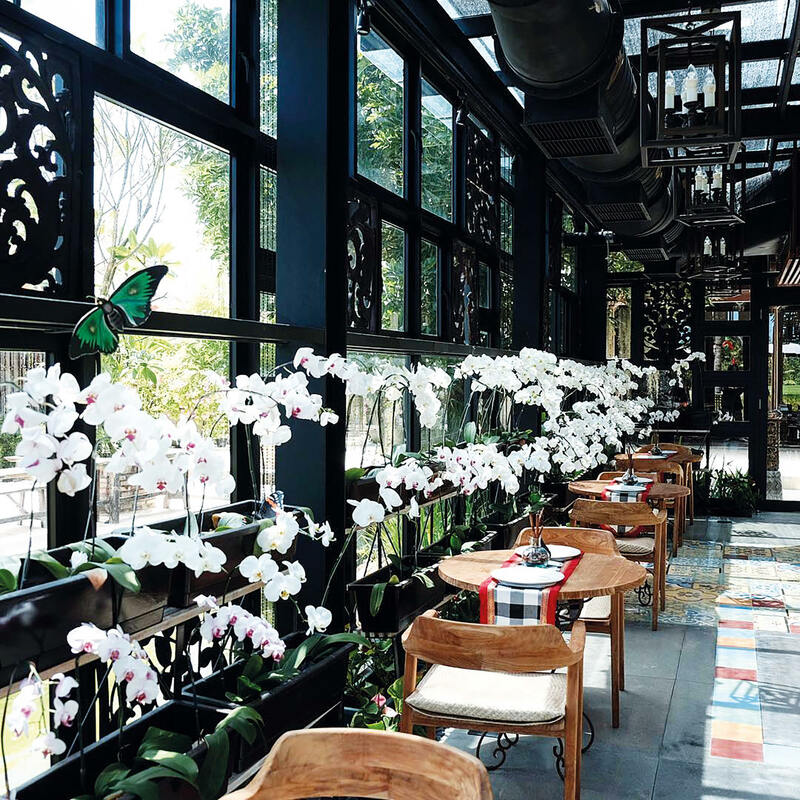 Orchid Tea Lounge is a chic greenhouse at Rimba, Jimbaran, by Ayana dedicated to afternoon tea. It has a glass roof and walls so you can take snaps of the beautiful garden. The high tea menu consists of tea and a mix of Balinese traditional cakes, cookies and sandwiches. All housed within a modern glasshouse designed with industrial details and an exotic collection of potted orchids. The Tea Lounge is infused with warm natural light and showcases views of the flowering gardens and rice field beyond. Campuhan Ridge Walk is great for lovers of photography and is now one of the top Bali Instagram spots. The 9km hill track hike lets you enjoy cool fresh air and probably the most gorgeous hillside vista in the region. Instagram-beautiful rice paddy slopes, an undulating sea of green, covered in tall reed grass. The sparse crowds and the aesthetically rich vistas remind us of why people from around the world come to picturesque Bali. Cabina is good for bringing back teenage memories of holidays in Santorini. Their “Tropical Floating Breakfasts” enjoyed while floating around in the Cabina pool is a fun experience. Good food and a nice ambience. Lovely staff will take pics for you. Very Instagrammable. The place is ideal for chilling all day with friends. It’s recommended to arrive in the mornings when Cabina is not so crowded and you can get some cool Instagrammable photos. The Tegalalang rice terraces are an Instagram must-see and are located about 25 minutes from Ubud. After a few happy-snaps at the top, overlooking the lush green valley, you can actually walk down and stroll through the rice fields. Even without an upload tag, people will definitely know where in the world you are. So, if you are looking for a surreal photo backdrop then this is your spot. Once you’ve taken the required number of Instagram happy snaps, you can cool off with a Bintang beer at one of the local food stalls. Mad Pops Ice cream, located in Seminyak, offers plenty of neon lighting and Instagram fame. The Loft is one of the most photographed walls in Bali. Their pink mural in Canggu has become Instagram-famous for its likeable slogans. Sea Circus, Seminyak, delivers delicious, healthy food, and colourful wall art. Old Man’s, Canggu is the hippest place in Canggu. Drop in for the beer pong nights, but don’t forget to get that snap for “the gram”. Graffiti Vessel, a boat stranded on the southern coast, is a popular spot to take photos, sitting or standing on the boat, where Graffiti artists display their interesting art. Located at Nyang Nyang Beach. When the cliffs form in the shape of a Tyrannosaurus Rex it is bound to be an Instagram crowd pleaser. Located on Nusa Penida Island, the walk down to Kelingking Beach makes for the perfect Bali photo. Check out the restaurant, perched on the mountainside with some pretty extreme views. However, safety at Kelingking is reliant on a bamboo railing only. The lack of ordinary safety-measures should be noted. Be very careful as you walk along the edge. Enjoy the stunning view, while capturing lots of enviable, Instagrammable memories.